Applied Mathematics, Financial Mathematics, Control Theory, Game Theory, Fractional Calculus and Applications, Modeling of Bio-systems for Optimization and Control, Linear Programming, Nonlinear Programming, Stochastic Programming, Parametric Programming, Conic Programming, Discrete Programming, Dynamic Programming, Nonlinear Dynamics, Stochastic Differential Equations, Optimization with Artificial Intelligence, Operational Research in Life and Human Sciences, Heuristic Algorithms in Optimization, Applications Related to Optimization on Engineering. 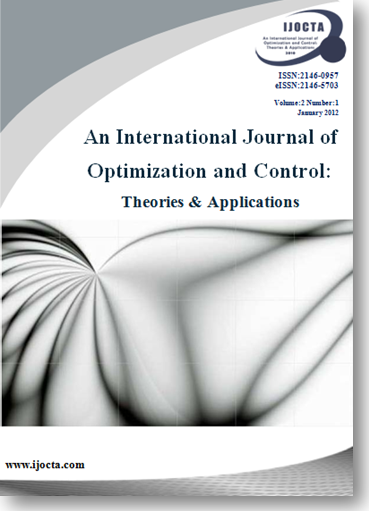 We have the pleasure to announce that our journal, An International Journal of Optimization and Control: Theories & Applications (IJOCTA), has now been indexed in the Scopus® database (https://www.scopus.com) starting from the first issue of 2018 (Vol.8, No.1). You may click here to see the articles published in IJOCTA and indexed in Scopus. Scopus®, a very well-known database and search medium run by Elsevier, is the largest abstract and citation database of peer-reviewed literature: scientific journals, books and conference proceedings. We acknowledge your continuing support to IJOCTA and look forward to receiving your high-quality manuscripts reporting the cutting-edge results in the related fields. In line with its main purpose of our journal, we want to inform all of you about some changes that will benefit to keep the actuality of papers and provide your valuable contributions to the relevant areas more rapidly. For accepted papers, unlimited and immediate online access to full article with DOI number and full bibliographic details (i.e. volume, issue, and page numbers) will be provided as soon as peer-review is completed and the requirements of the editorial process is fulfilled. In this regard, we expect from all contributors to continue their contributions taking into account this subject. IJOCTA is a biannual, peer-reviewed open access journal which is published in both printed and online versions. I want to highlight that this policy will continue to do so. Special issue dedicated to International Conference on Applied Mathematics in Engineering (ICAME'18) which was held between 27-29 June 2018 in Burhaniye, Turkey. This issue contains final, fully citable articles that are published online but the volume/issue itself is awaiting more articles before it can be considered "final".